I am so excited to share with you, my wonder-fab readers, my very first giveaway . . .
and because I LOVE my followers, I'm going to be offering more FREE giveaways in the future! This is NOT an advertisement for Starbucks. It's so easy to enter this giveaway! leave a comment at the bottom of this post telling me that you're a follower. leave a comment at the bottom of this post telling me that you "liked" it. 3. Grab my button and post it on your blog, inviting your friends to enter this giveaway. Leave a comment at the bottom of this post telling me that you introduced Delightful Order to your readers. I will announce a winner next Friday, February 25th. You truly are a D.E.L.I.G.H.T! I am a follwer :o) So excited for the gibeaway! I'm a follwer, I like your fb page. I dont have a blog, but I posted the button on fb for all my readers!! I'm a follower of Delightful Order! and loving it! I like Delightful Order on Facebook! I'm a follower and I _heart_ Starbucks! I 'liked' you on FB. Im very excited about your giveaway! I put your botton on my blog! Awesome giveaway! I'm a follower and enjoy reading your posts! Like you on Facebook! 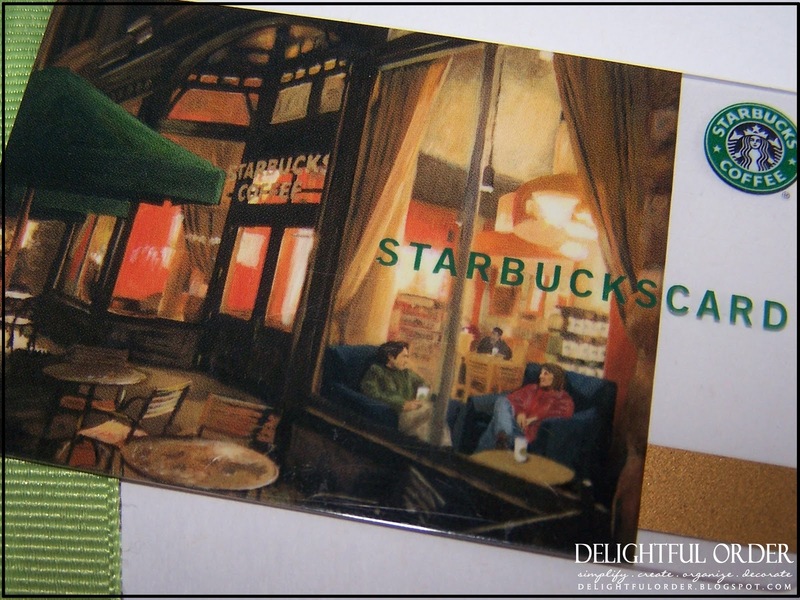 Thanks for the chance to win...I love me some Starbucks! I'm a new follower and I'm enjoying browsing around your blog! I follow your blog & I like your fb page. Thanks! Danita, I'm just blown away by your blog. You have some ideas here I think I can use. I'd love to be included in the Starbucks card giveaway. I follow via gfc as Dee! :) thanks so much for the chance! I have "Liked" the Facebook page. I like Delightful Order on FB. I think you are so creative, I am a follower! I added your button to my blog! Thanks for the inspiration! Stop by & check out my little project I took on today! Makes me want to tackle another one ASAP! I just found you through A bowl full of lemons! I LOVE your gift wrap station, and I'm looking forward to see what else you have in store! Also found you on bowl full of lemons and now a follower! Love what I see s far! I LUUUUUUUUUUURVE Starbucks! I could use one RIGHT NOW! I'm a follower now. :) Stopping by from A Bowl Full of Lemons. Im a follower and just LOVE your ideas..you are very talented. I'm a follower! I love your blog and I love Starbucks coffee. Thanks for the chance to win. (I'm not on facebook...yet). I like your facebook page (No - I love it actually) and am now a follower of Delightful Order!! I am both a follower of your blog as well as a fan on your facebook. You are also 1 of 7 featured blogs that I share on my blog, www.renewedspaces.blogspot.com. I am a new follower of your blog - love the organization tips. I'm a new follower and am getting great tips on how to organize my home-thanks! I'm a follower of your blog. Thanks for the chance! I just love taking a look around! nursepaula06 (at) yahoo (dot) com. I'm a fan on facebook. Thanks for the chance! I just love taking a look around! nursepaula06 (at) yahoo (dot) com. I blogged about you on my website :) Thanks for this! Love reading your blog, you are so creative!